Amphibious travel trailer that can serve as a traditional camper on campgrounds and as a motor-boat on the water preserving in both cases the function of a “Home-away-from-home” since long was rather wishful thinking (if not dreaming) than the reality. Traditionally, most people that would like to “take the road” but also explore waters will pack their little boat either on the RV roof or pull it behind the camper. May be the most sophisticated example of the first solution is -> Americam Dream Trailer. However, the recent progress in technology as well as what probably is more important, an opening market of “high-end” users willing to pay the price to live undoubtedly mind-blowing experience made the RV/Marine market ripe for introduction of so-called CaraBoats. 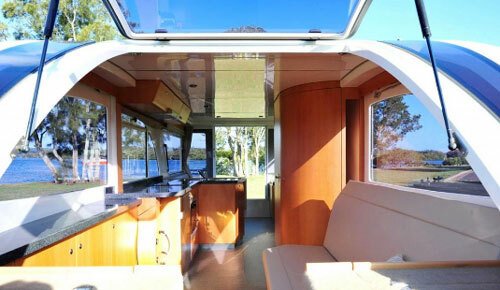 Out of few currently existing designs probably the most eye-catching is a design by an Australian boatbuilding and repairing company Composite Cats Pty Ltd (Lemon Tree Passage, New South Wales). The name “CaraBoat” is a combination of a Caravan (in US rather known as Travel Trailer) and what is more obvious – Boat (in this case motor-boat). It took four years to Rob Shenn and Andrew Kiernan (company directors, but in this program acting as visionaries, skillful designers and production engineers) to materialize their dream. 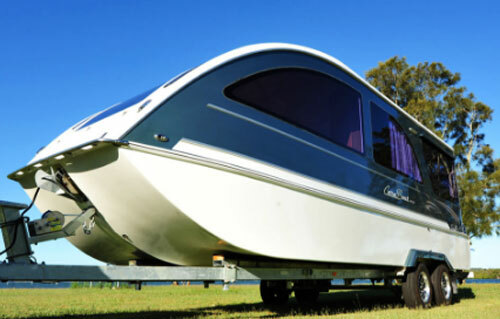 But the outcome is really spectacular – a stylish, ultramodern, easy to tow trailer that can compete with (actually “outshine”) many traditional mid-range campers, but then when on the water it swiftly transforms to high-performance, luxurious motor-boat, a perfect platform to discover otherwise hidden waterways…. For nature lovers as well as “romantic souls” the CaraBoat literally opens “new horizons”. For those lucky being able to afford this “baby” the “sky still may be the limit” (it depends on imagination) but certainly the land and water not anymore. 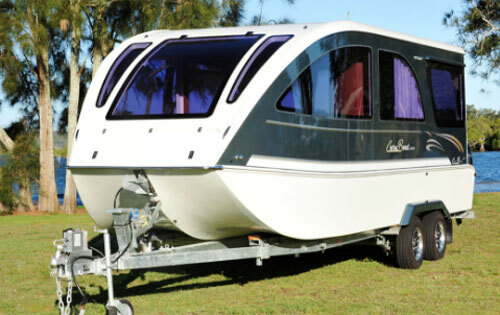 The Caraboat 7500 is a floating camper that can serve as a classic travel trailer, boat and a houseboat. 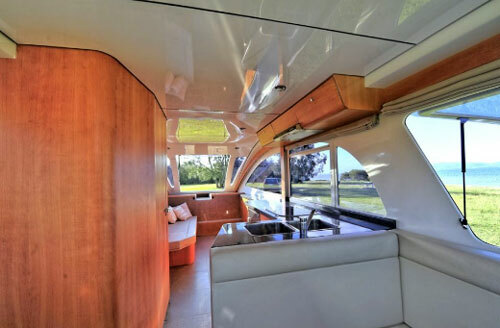 Despite such versatile “all-in-one” design, its interior reflects traditional RV camper requirements. The custom-designed twin-axles trailer looks like suspension frame of traditional campers. To keep camper’s overall height lower the trailer’s wheels are placed in the wells at both sides of the hull. It contributes to better aerodynamics on the road and equally important – stylish, pleasing look. But the trailer also serves as a launching platform to slide camper’s body on the water. “Switching” the operating mode from land (camper) to water environment (boat) is almost seamless. Needless to say, that the trailer is part of the standard Caraboat’s package. Thanks to molded fiberglass body construction and aluminum trailer the whole unit with is approximately 5,500 lbs weight belongs to the class of lightweight RVs. It’s also a no-rot, no-corrosion and so “no-headache” design. The entrance door is located at the rear side of the caraboat via a set of stairs. It leads to the lounge/entertainment area with seating for 6-7 persons and a large removable table. For night the seating and the table can be converted into a dual bed. Optionally, a top-opening fridge/freezer in the corner can be a priceless source of cold drinks during parties. The L-shaped kitchen includes 3-burner cooktop with a lid not only adding the stylishness to anyhow very elegant interior design, but also extending the working space. The range-hood with an electric fan and LED lights as well as an oven and grill below the cooktop offer residential-like capabilities. Twin-bowls stainless steel sink, large refrigerator with freezer and plenty of cabinets including overhead ones located along the galley make the kitchen a comfortable place for “culinary” activities. 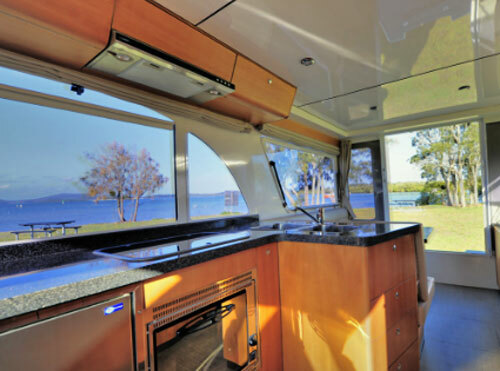 The optional dual mode fridge/freezer located at the back allows to freeze the food for longer, “out of civilization” trips (especially important when on the water). The full-height pantry and slide-out hanging locker on the opposite side provide always needed storage space. Next to the pantry is located the walled bathroom. 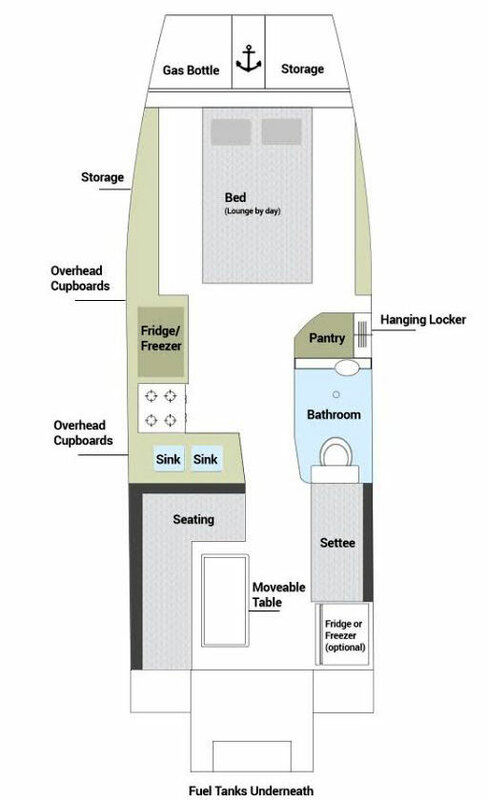 It includes retractable shower, vanity w/mirror, Dometic cassette toilet and Seadeck non-skid floor. Inside spotlessly white, outside the bathroom matches the finishing colors seen throughout the camper. Water heater and spacious water tanks provide necessary “support” and thanks to their decent size – large travel autonomy. At the front there is another spacious lounge that for night converts into the splendid bedroom. 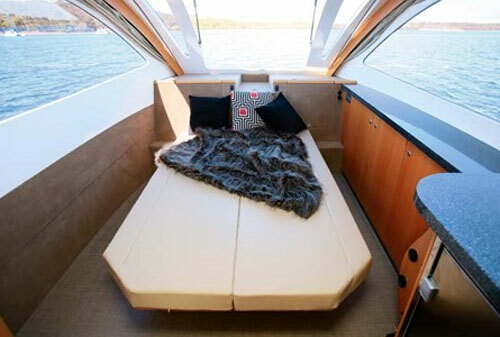 The sofa slides out from the side and opens-up making an “island double bed” surrounded by walls of windows. Indeed, in a nice, clean night, you can feel like sleeping under the sky…. It’s because the caraboat has large windows all around the main body. They provide generous opening for natural light and offer incredibly panoramic views. Once opened they allow for direct air-flow throughout the unit (especially amazing is the front window - when opened up, it literally brings the outside in !). The tinting guarantees much needed privacy. Up the front there are lockable storage compartments. One is used for storing the anchor, while the other one (waterproof) is used for LPG bottles and any other stuff you may choose to take (life jackets, ropes, etc..). Attached to the right side of the camper is an optional 11.5 ft long awning greatly extending the living space into the nature. Thanks to the opening-up windows in the kitchen (also located on the right side of the camper), it is very easy to pass meals and drinks to the outside without the long walk through the back doors. Standard 200W solar panel feeding three internal deep-cycle batteries offers comfortable power autonomy. Optional, roof-mounted extra solar panels can be ordered, but it is worth to mention that both Tohatsu engines can also add substantial energy (30 Amps feed) to the power budget when operated in generator mode. Caraboat does not have a real cockpit; the engine and steering control console folds into the slot in the cabinet so the interior does not look like a boat (it lifts out to waist height in the boat configuration) Only two outboard engines hanging on the back remind that the caraboat has floating capabilities. As mentioned above, the caraboat is designed as a floating travel trailer, so with exception of two large engines at the back it has little visible similarities to typical boats or yachts. The most noticeable is the lack of a larger deck. The small open area at the back is designed more as part of the entrance than a recreational deck. It holds a swim shower – an obvious choice when on the water. Under the deck are located dual fuel tanks. Their “outdoor” location increases camper’s safety. 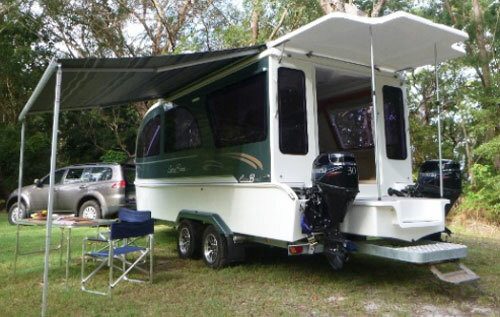 Fortunately the newest caraboat models have an optional large detachable rear deck that in the camper configuration is stored under the main body on the trailer. It is a floating platform that can be attached to the rear expending the outdoor space where you can rest, enjoy a sunbath or simply a glass of your favorite drink…. Thanks to the hull’s punt-shape design (flat-bottom with square-cut bow), the caraboat has very shallow draft (only about 8 inches). This allows for exploration of small rivers and in general shallow waters as well as helps approaching river banks or stepping-off onto a beach…. The “gull-wings” on each side of the caraboat increase the stability on the water at rest. Standard engines are made by Tohatsu (Japan’s oldest manufacturer of marine equipment). With combined 60 hp, engines assure top speed of about 17 knots/19.5 mph (although for fuel economy and smooth ride suggested cruising speed should be in the range of 13-15 knots/15-17 mph). Twin-engines design not only increases cruising safety but also greatly improves boat’s maneuverability. The foldable helm (hidden in camper’s mode) easily flips back for boat mode. It includes twin-engines controls, soft-touch steering wheel with stainless steel spokes, few digital gauges and indicators. Launching the Caraboat 7500 into the water is an easy process – simply speaking, the hull smoothly slides from the trailer. Prior to launching, the mudguards protecting the Caraboat from splashes have to be removed. But this is not the end. The company is ready to discuss any optional requirements and work with customers on possible implementations. 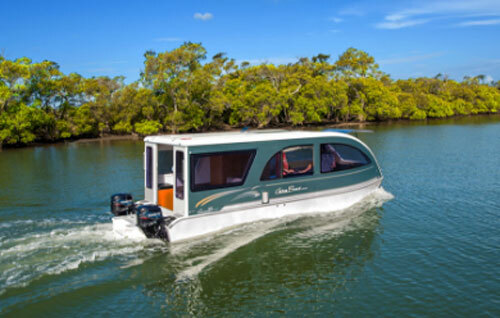 The bottom line – the Caraboat 7500 opens new possibilities for nature explorers including otherwise not accessible by classic travel trailers waters…. And the good news is – recognizing the fact that discovering the nature quite often forces us to take “roads less travelled” (in other words ‘unbeaten paths), the producer is working on the “off-the-road” caraboat’s version. While currently the Caraboat is available only in Australia for a “modest” 140k Australian dollars (about 107 thousand US dollars) , the company is actively looking for opportunities to expand its business to US. Let’s cross fingers they will succeed.